May 25, 2012 New Thank-you! Thank-you to everyone who shared news of the IndieGoGo campaign! Many, many thanks to those who contributed! I will be setting up my proverbial ‘Lemonade Stand’ to continue fundraising efforts for prototyping and will post updates on new efforts in the coming weeks. Thanks for joining me on the journey! Onward and upward! Last call for the IndieGoGo campaign! Thinking of contributing? You have until midnight tomorrow – Wednesday, May 16th – to decide which of the limited-edition felted-wool perks you simply can’t live without! Visit the IndieGoGo campaign page to view perks and contribute. 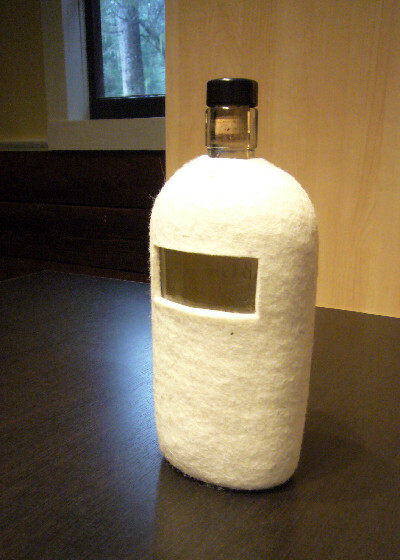 Two felt-wool wrapped glass bottles. A $75 contribution will get you two felt-wool wrapped glass candle votives. Available until the campaign ends on Wednesday, May 16th at midnight! Includes a set of (4) postcards featuring images from the Form Felt Lab archives and your name on the Supporters page of the Form Felt Lab website. Visit the IndieGoGo campaign page for details. 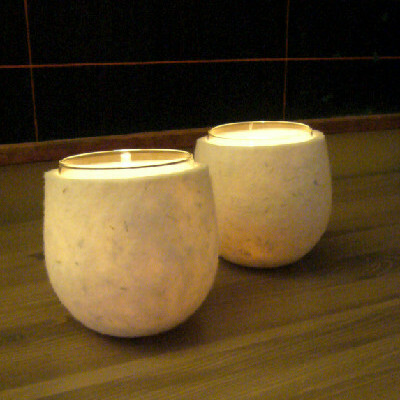 Two felt-wool wrapped glass candle votives. The winners of last week’s draw are: Natasha Smith, Alex Elmsley Carriere and Neena Sood! Thank-you for sharing notice of my IndieGoGo campaign! Each of you will receive a set of postcards featuring images from ‘The Sound of Silence’ installation. Only five days left! Share notice of the campaign and have your name entered for prizes! Visit the project page to share via Twitter, FB, Google + or to send an instant email message! IndieGogo does not track shares, so please visit Form Felt Lab on Facebook and ‘like’ or ‘share’ this same post to be entered. Winners will be drawn and announced on Wednesday, May 16th. A $75 contribution will get you a small (4×6 inches) felt-wool wrapped glass hurricane lantern. 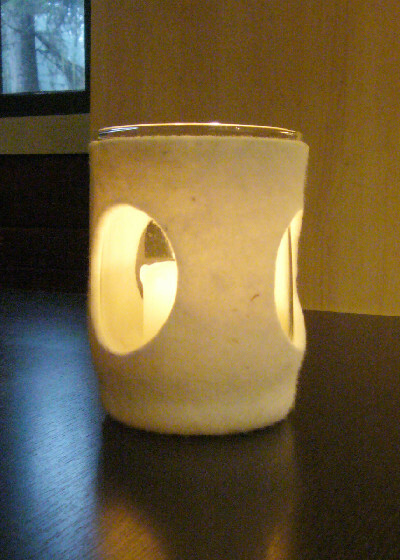 The felt-wool filters the glow of candle light and casts a warm glow. Limit of 10. Available until Sunday, May 13th – Mother’s Day! felt-wool wrapped glass hurricane lantern. Read the story behind the invention, peruse the limited-edition felted-wool perks created for the project and make a contribution if you’re inspired to (and I hope you are)! May 4, 2012 Share campaign and win prizes! It’s the start of a new week – share notice of my IndieGoGo campaign and have your name entered for prizes! Three winners drawn every Wednesday. Form Felt Lab is a multi-disciplinary studio focused on exploring the potential applications of the Form Felting Machine and Process, invented by Deborah Loxam-Kohl. Loxam-Kohl received her BFA from the Alberta College of Art and Design in Calgary, Alberta, Canada in 2003. She is the recipient of a number of awards, most notably the 2003 Collegiate Inventors Competition Undergraduate Award from the National Inventors Hall of Fame and the 2005 Concept, Innovation and Extension Award from the International Wool Textile Organization.